Provides a general overview of the different aspects of gastric cancer. Written by experts in their fields. Gastric cancer is one of the most common and potentially lethal gastrointestinal malignancy, but it is now at the forefront of modern oncology due to new discoveries. In recent years, the field of gastric cancer has been transformed by many notable developments in both the diagnostic area and the therapeutic strategies. The main aim of the text is to propose a comprehensive, state-of-the art review of this field, and will serve as a valuable resource for oncologists, pathologists, surgeons and researchers with an interest in gastric cancer. The first chapters will review the interplay between pathogens and especially H. pylori, inflammation, genomic instability, and tumorigenesis. Secondly, an exhaustive overview of the diagnosis of gastric cancer from a clinical/endoscopic and pathologic perspectives will be illustrated. Two specific chapters will deal with tissue and serum biomarkers with an important role in diagnosis as well as prognostic and predictive markers of response to specific therapy. A central section of the book will focus on treatment options available today for patients. Surgery is the cornerstone of treatment for gastric cancer; however, the prognosis of patients with locally advanced disease is still poor even after curative resection. Therefore, in order to improve the prognosis of patients, especially with advanced stage, a multimodal strategy is advisable and is thoroughly addressed in the appropriate section. With the advent of next-generation sequencing and new preclinical model technologies, the genomic landscape of gastric cancer has been delineated and molecular characterizations finalized to novel therapeutic targets of each molecular subtype have been identified. These advances are making it feasible to integrate clinical and phenotype-based diagnostic and therapeutic methods and are described in a dedicated section. 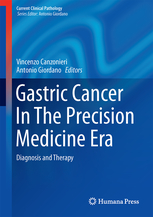 The text will conclude with chapters focusing on the future direction of gastric cancer research in the precision medicine era: an in-depth analysis of non-coding RNAs and their role in gastric cancer, the impact of immunomodulation/immunotherapy and the perspectives of nano-medicine will be finally proposed to the audience. A brief review of the existing literature addressing the above mentioned topics will be present in each chapter. This text will serve as a useful resource for physicians and researchers dealing with, and interested in, this challenging malignancy. It will provide a concise yet comprehensive summary of the current status of the field that will help guide patient management and stimulate investigative efforts. All chapters will be written by experts in their fields and will include the most up to date scientific and clinical information.